In the early stages of WWII, the German military often used the Sd.Kfz.231 series vehicles for reconnaissance missions. One of these heavy armored cars was the Sk.Kfz.232, which was equipped with a long distance wireless radio with a large antenna protruding from the top of the upper hull. In the turret was a 2cm gun and a MG34 machine gun. The 8- wheeled, Sk.Kfz.232 had an on-road top speed of 90km/h, front and rear driving positions, and a superb 8 wheel drive system. The Sd.Kfz.232 performed extremely well and proved its worth in a number of roles on many fronts from Europe to North Africa to Russia. * Various kinds of equipment like early type jerry cans and tools are included adding further realism. * Comes in a newly designed package with desert themed artwork. * Enhancing the impression of the North African front is a German officer figure wearing a tropical uniform. * A soldier figure for the turret is also included. * Photo-etched parts such as light protecting net s and an aluminum barrel for the 2cm gun are included. * Comes with decals for the North African front (2), Balkans front (1), & Kursk front (1). 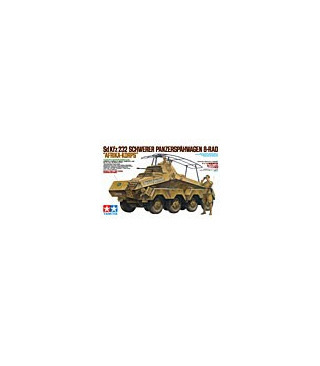 * Displaying this armored car with other 1/35 scale models such as Item 35286 German Armored Car Sd.Kfz.222 would be an interesting diorama.